Thinly slice the stale bread, set aside. 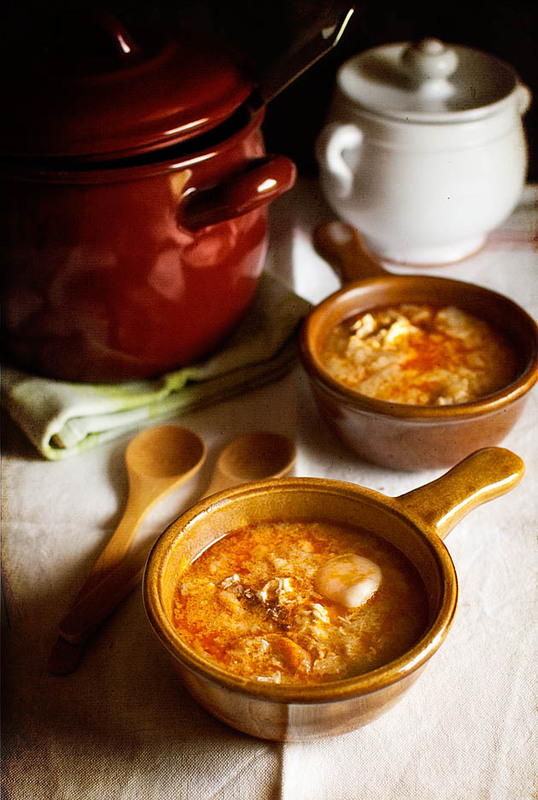 Pour the oil in a pot or better, in an earthenware cazuela, which is the proper way to make garlic soup, and sauteé the sliced garlic cloves, till golden. Add the diced chorizo and sauteé 1 minute. Then add the pimentón, stirring for another minute, just to lightly toast it. Never allow pimentón to brown, as it develops a bitter taste. Add the wine and let concentrate for a couple of minutes. Add the bread and toss so that it absorbs the flavors. Then pour the water and add the salt. Let simmer 6-8 minutes for the bread to soak the liquid and the flavors to blend. The soup will feel somewhat gelatinous because of the bread. Taste the seasoning and adjust if necessary. Keep the soup steaming hot. Serve the soup in small ramequins or bowls, and add 2 quail eggs to each (1). Let the soup sit for a couple of minutes or more; the hot soup will make the eggs set.